You can create custom xml attributes and add them to existing UI elements. 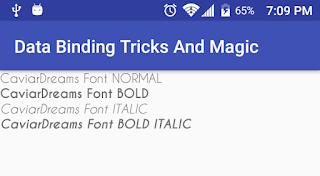 For example if you ever had to use a custom font files in your application you would always have to set the type face programmatically as the TextView or its sub classes did not have an xml attribute to set the custom type face file from xml. With data binding you can implement your own attributes quick and easy. First lets define our binding adapter. The parameter in the @BindingAdapter declares the name of the custom attribute we are creating. The the first parameter to the function marked with @BindingAdapter is always the type of the ui element we are using this custom attribute on. Next parameter is the value the attribute takes in the xml. 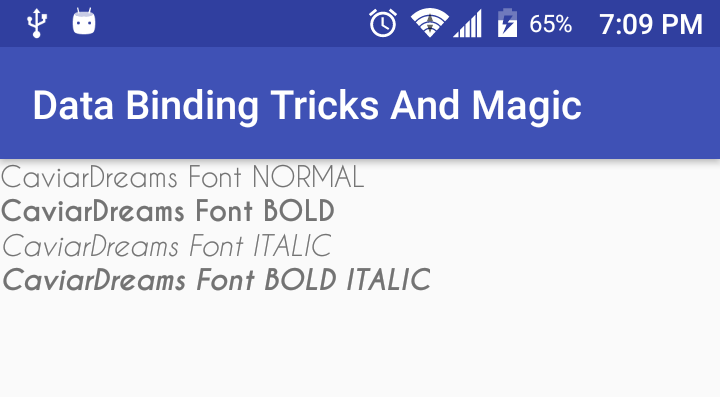 An now we can use the :typeface attribute in our layouts. An that is it! Now we have an attribute we can use to set custom fonts on out sub classes of TextView like EditTexts and Buttons. Next lets set an image from a url with a custom attribute. As a full time Android developer I had a dream that one day I would no longer have to write repetitive adapters for RecyclerViews. 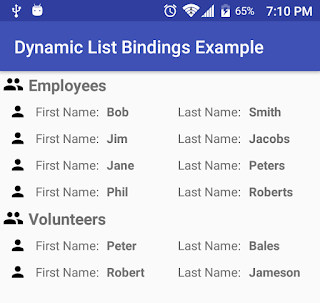 Taking advantage of dynamic variables in Android Data Binding library we can finally write ONE adapter for ALL or our RecyclerViews. The AdapterDataItem model contains layout id field and a list of integer - object pairs. 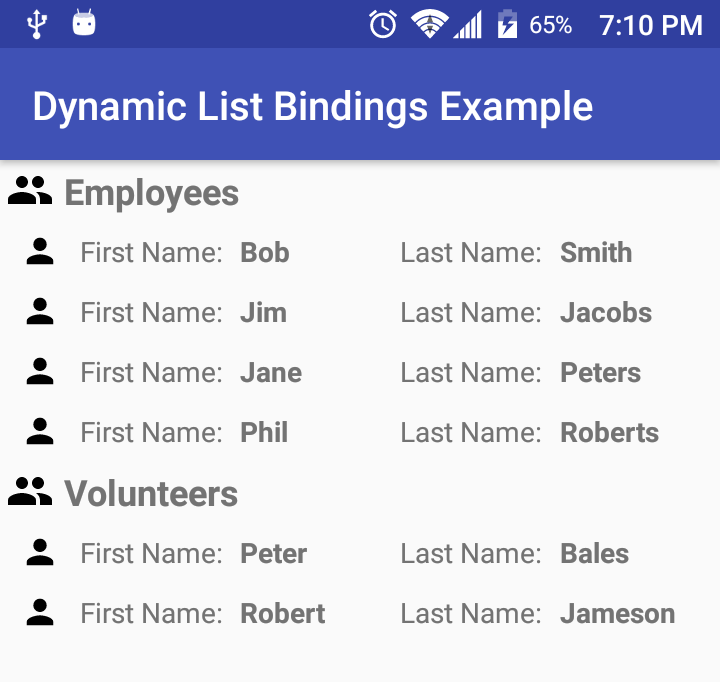 The reason for this is because any layout with data binding can have multiple variables and for dynamic variable bindings we need to know those variable ids for each layout in order to pass the data models from the code. That's one clean adapter! Notice in the onBindViewHolder() method we dynamically set the variables from our list of AdapterDataItems. Also getItemViewType() returns the layout id in order for us to know which layout to inflate in onCreateViewHolder() method. Here we define custom attributes to set the :list of models and :layoutManager for our RecyclerView. Now you are all set to use this dynamic adapter with any RecyclerView and any row layouts. This is the layout for a header row. This is a layout for item row. In our Activity onCreate() we pass the list of models and the LinearLayoutManager to the binding instance. In getModelList() we created a list of models with header rows and info rows. layout_item_heading.xml binds to a string variable and that variable's id is BR.groupName. BR is a generated class with binding variable ids similar to R class. layout_item_info.xml binds to a Person model and that variable's id is BR.personModel. layout_item_info.xml also takes PersonPresenter for the row's onClick listener. In our case the ListExampleActivity implements PersonPresenter.onPersonClicked() method. 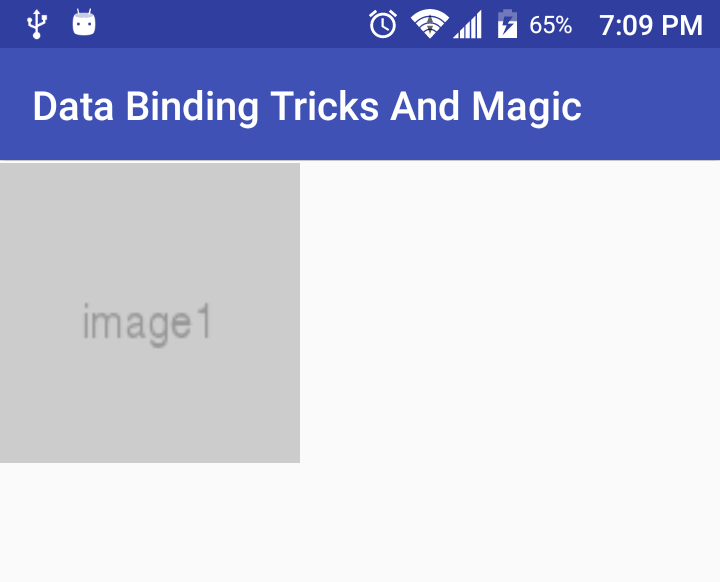 As you can see the power of Android' Data Binding library and its potential to simplify and eliminate repetitive tasks in Android developer's everyday life. Hopefully this post was convincing enough for you to start using it in your production applications. 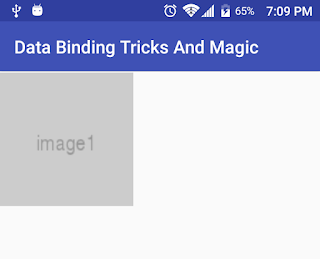 What other cool things do you use Data Binding library for? Let me know in the comments bellow! Liked this blog post? Want to learn more?